DriveU is committed to ensuring that your privacy is protected. Should we ask you to provide certain information by which you can be identified when using this Website/Application, and then you can be assured that it will only be used in accordance with this privacy statement. DriveU may change this policy from time to time by updating this page. You should check this page from time to time to ensure that you are happy with any changes. We use your first and last name to make your experience with DriveU seamless. We use your email ID for sending any transactional messages, recipts and occasional promotional communication from DriveU. We use your phone number to verify your identity, connect you to our drivers and for communication between DriveU, Our Partners and you. 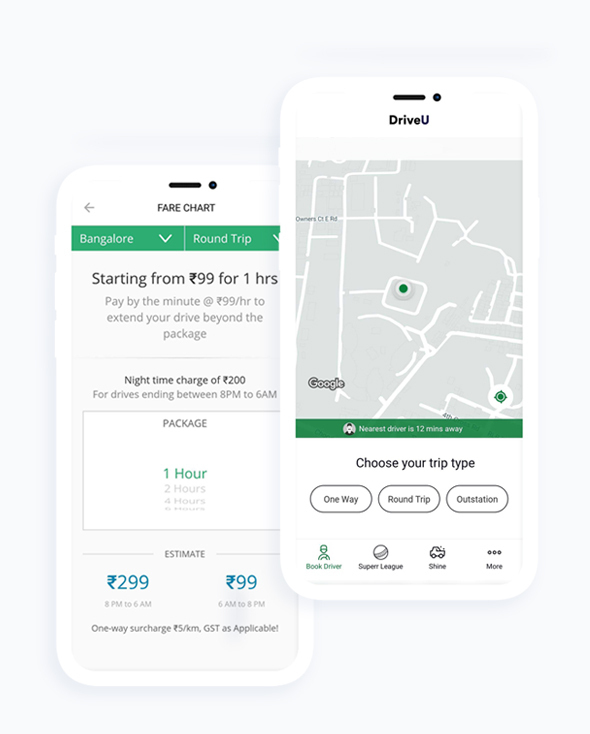 We use your location info as provided by you through the DriveU mobile application or website to find nearest drivers, calculate your fare and other related activities. We use your phone's IMEI number, as provided by you, to identify your device uniquely in our system, to help us diagnose any issues, and to prevent account fraud. We use analytics tools to understand your usage of the DriveU app, the DriveU website and our services to better your experience with us. We use financial info such as authorization of payment wallets and other forms of payment providers to help you pay online for our services. Any and all online transactions on DriveU are handled by our payment partner and secured by them with the best security measures available. We store and use user generated content to make your experience seamless, to help them provide feedback, review our services and get help in relation to the usage of our services. We may periodically send promotional emails, SMSs or push notifications about new products, special offers or other information which we think you may find interesting using the email address which you have provided; and From time to time, we may also use your information to contact you for market research purposes. We may contact you by email, phone, fax or mail. We may use the information to customize the Website/Application according to your interests. You are solely responsible for the confidentiality of any password and other account information that you create in order to access or use the Website/ Application. You agree to notify us immediately on any unauthorized use of your account, user name, or password. You also agree that DriveU is not liable in any manner for any loss that you may incur as a result of any third party using your password, either with or without your knowledge. You are solely liable for any losses incurred by us, our affiliates, officers, directors, employees, consultants, agents, and representatives due to misuse of your account or password. You will not under any circumstances use the account, username, or password of someone else at any time. You are prohibited from violating or attempting to violate any security features of any of our Website/ Application, including, without limitation: (a) accessing content or data not intended for you, or logging onto a server or account that you are not authorized to access; (b) attempting to probe, scan, or test the vulnerability of any of our Website/ Application or any associated services, system or network, or to breach security or authentication measures without proper authorization; (c) using any automated process or service (such as, by way of example only, any spider, robot, or automated searching or "scraping" tool) to monitor, access or copy any content from any Website/Application; (d) interfering or attempting to interfere with service to any user, host, or network, including, without limitation, by means of submitting a virus to the Website/Application, overloading, initiating or facilitating any "denial of service" attack, "flooding," "spamming," "mail bombing," or "crashing;" (e) using any our Website/ Application or servers to send unsolicited e-mail, including, without limitation, promotions, or advertisements for products or services; (f) forging any TCP/IP packet header or any part of the header information in any e-mail or in any posting using any our Website/ Application; or (g) attempting to modify, reverse-engineer, decompile, disassemble, or otherwise reduce or attempt to reduce to a human-perceivable form any of the source code used by DriveU in providing the Website/ Application or our Services. Any violation of system or network security may subject you to civil and/or criminal liability, and will result in a loss of your ability to access and use the Website/Application. You agree, understand and confirm that the credit card details provided by you for registering as this Website/ Application will be correct and accurate and you shall not use the credit card which is not lawfully owned by you. You further agree and undertake to provide the correct and valid credit card details to us. Further, the said information will not be utilized and shared by us with any of the third parties unless required by law, regulation or court order. Overall, cookies help us provide you with a better Website/Application, by enabling us to monitor which pages you find useful and which you do not. A cookie in no way gives us access to your computer or any information about you, other than the data you choose to share with us. Our Application /Website may contain links to other websites of interest. However, once you have used these links to leave our site, you should note that we do not have any control over that other website. Therefore, we cannot be responsible for the protection and privacy of any information which you provide whilst visiting such sites and such sites are not governed by this privacy statement. You should exercise caution and look at the privacy statement applicable to the website in question. Notwithstanding the above, we confirm that we shall at all times be in full compliance with the Information Technology (Reasonable security practices and procedures and sensitive personal data or information) Rules, 2011.